Recognizing potential problems and planning ahead is better than missing something that should have been dealt with. 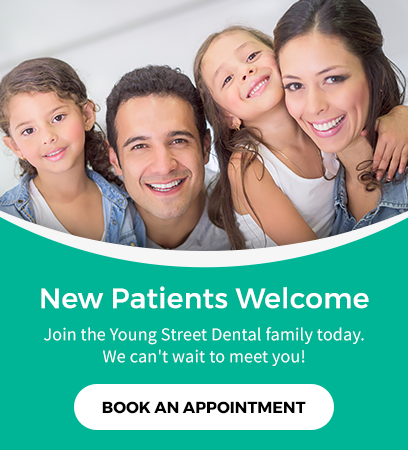 At Young Street Dental in Chilliwack, we believe that prevention and dental hygiene are critical for patients to have good oral health. This is why we recommend regular dental checkups to our Chilliwack patients. As the children get older they will begin to lose their baby teeth and get their first adult teeth. This occurs around age 5-7, typically earlier with girls and later with boys. In the first round of losing baby teeth, they will lose 8 and gain 12 adult teeth. The three most common problems we deal with in this age group relate to decay, orthodontics (how the teeth and jaws develop to get a beautiful healthy smile), and trauma (sport injuries for example). Prevention and early problem solving can save a lot of needless suffering. Brushing and flossing from baby to late teens helps keep cavities away. For adults, brushing and flossing helps keep gum disease away. At around age 11-13 the second round of losing baby teeth occurs. The child will lose 12 baby teeth and get 16 adult teeth. Into adulthood, we are trying to maintain a healthy disease free mouth. Hygienists work with us to help our patients care for their gums and teeth. We will monitor and check our patients on a regular basis and provide any needed care. Anything that requires referral to a specialist will be facilitated by us. We often become the gatekeeper for certain problems to be dealt with, meaning we will either provide the care or refer to someone who will deal with it. Falling through the cracks and missing needed care is not what anyone wants. As our patients continue to age, we work with them to maintain optimal oral health. Medical conditions and medications will have effects on oral health and we want to minimize or eliminate dental issues that can result. We work closely with the medical doctors to ensure oral health is being maintained. The needs of each and every patient are unique and it takes a dedicated team of professionals to ensure that the continuum of care from baby to senior is being met. Contact us to book an appointment.